Whether one agrees with its findings or not, Thomas Piketty’s Capital in the 21st Century has had a profound impact on the study of inequality in the United States. Partisans of the work hastily embraced his suspect empirics as confirmation of exploding inequality, and this endorsement has largely filtered into the political discourse where it is uncritically repeated as “fact.” For all its empirical acclaim, Capital actually offered very little in the way of newly generated data. Almost all of its charts are derived from other sources in the secondary literature. A few of these include original studies by Piketty, but the vast majority – including all of his figures on wealth inequality in the United States – are actually aggregations of other scholarly works. I’ve commented extensively on a multitude of problems afflicting Piketty’s aggregations, including extensive cherry-picking between secondary sources to produce a desired shape on his graphs. It’s nonetheless interesting to step back in time to shortly before the English edition of Capital appeared, if only to look at how other inequality scholars were interpreting the same data. The answer: very differently from Piketty. An illustrative example may be found in this early 2014 article by Jesper Roine and Daniel Waldenstrom. Like Piketty, its authors performed a comparative study of inequality over time in different nations. They used virtually the same secondary literature for their data, and in some instances tapped additional sources that Piketty neglected. Yet the trends they found carried nothing near the certainty that Piketty attaches to his claim of rapidly rising inequality. The following graph, for example, illustrates their composite measure of the top wealth shares in the U.S. over time. It is assembled mostly from the Survey of Consumer Finances (from the 1980s to the present) and an assortment of predecessor surveys going back to the early 20th century. They overlay portions of this data with the 2004 estate tax estimate of Kopczuk and Saez. Note the patterns that emerge in their chart. They show the wealth distribution for an assortment of top income percentiles, all of which are either flat in recent decades or only modestly rising. Recall that Piketty took more or less the same data sources and produced (or, really, manufactured) a clear upward trend in inequality starting around 1980 and continuing to the present day. Roine and Waldenstrom are significantly more cautious in their interpretation of these data. Whereas Piketty finds only evidence of an inequality explosion, Roine and Waldenstrom see movement in both directions. 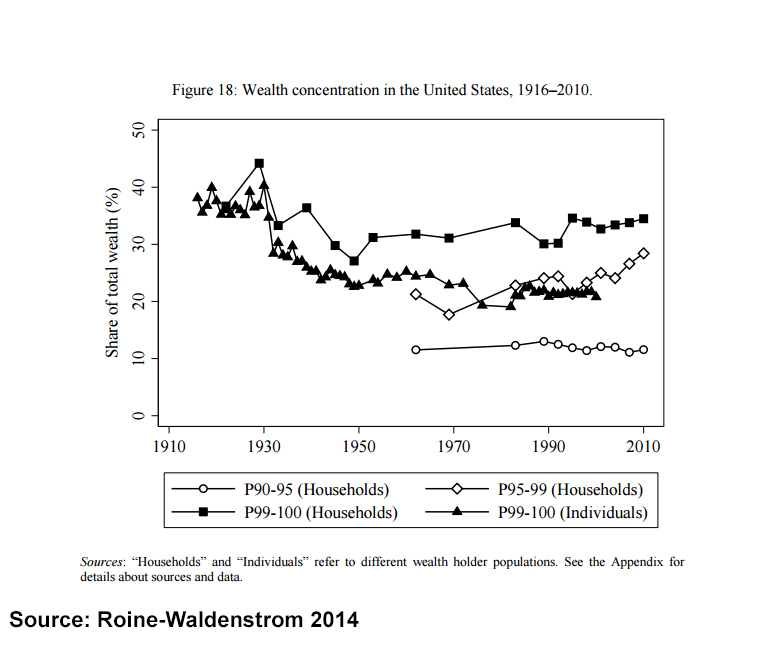 They note the “top percentile wealth shares remained low until the 1980s when the top household percentile’s share increased significantly, peaking around mid-late 1990s and then to decline somewhat in 2001.” Continuing, they find that “by contrast, the top adult percentile wealth share from the estate series in Kopczuk and Saez (2004) exhibits no such increase.” This is a somewhat surprising pattern to them given other evidence of rising income inequality. Yet they resist the temptation to shoehorn the data they have into a pattern of rising wealth inequality and instead stick with a cautious explanation. This observed contrast, of course, raises another question about the present state of inequality studies. 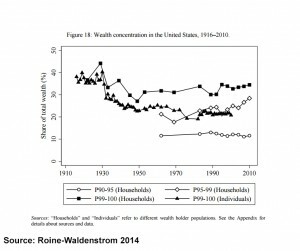 If other scholars (a) were already using more or less the same data sources as Piketty, and (b) produced significantly more measured and less politicized interpretations of their trends in recent decades including caution before proclaiming an explosion in the wealth concentration at the very top, then what exactly was the actual intellectual contribution of Piketty’s book? Judging by the aforementioned study, it seems to have accomplished little more than muddying the ongoing empirical examination of inequality with an aggressive political agenda. Unfortunately that agenda has since been promoted through a highly slanted presentation of data. That data neither originated with Piketty nor supported the empirical patterns he later claimed to find. Piketty’s primary, and perhaps only, contribution to the inequality debate would thus seem to be its rampant politicization in support of an ideologically driven tax agenda. 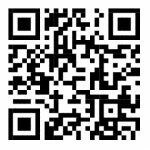 This entry was posted by Phillip W. Magness on Thursday, December 31st, 2015 at 2:30 am	and is filed under Uncategorized. You can follow any responses to this entry through the RSS 2.0 feed. Both comments and pings are currently closed.